Pretty good movie except for all the rap (crap)music. It's not great art, but it is a great movie. Great story and an excellent production. Somewhat predictable, but I loved it! Would rate it more at 3.5 stars instead of 4. A good story with twists and plenty of good boxing scenes . Also nice that not much foul language in it . However the film dragged at times and could have been 15 to 20 minutes shorter. Also , the predictable formula of previous Rocky films . Liked Creed 1 better overall. Loved this movie...saw it twice. 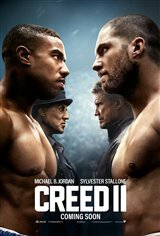 It’s a must see that will keep you on the edge of your seat and cheering for Creed. As a native of Philadelphia I was able to relate to the Rocky series and very familiar with the neighborhoods depicted in the film. Stallone doesn’t disappoint. All I can say is Excellent. The story was amazing and so many surprising actors are brought back to complete the continuing screenplay. Bravo! I am a Rocky franchise fan. I have never expected another movie but have always been pleased to see another chapter in Rocky’s life. I like how the story has stayed realistic and that the characters have stayed consistent. While I throughly enjoyed Creed 2 I think this should be the end. All stories have been reconciled. I look forward to watching this repeatedly like I do the others. Even the sound track is great. Liked the characters but this one ends up like Rocky 4. Tough follow up to the first Creed. Thought there would be more boxing. it was okay! Awful soundtrack. How many times is Stallone going to make this movie??? ROCKY BALBOA was the perfect ending; they're just milking it now. GREAT MOVIE AND TWO THUMBS UP!!!!! If you haven't had your nap yet , go see this one! What a sleeper! Brigitte Nielsen gives the performance of her career, but even she can't save this. Well acted. Good story line. Yes there have been a lot of Rocky movies but this was worth the watch. Entertaining and engaging. Thumbs up! I love Tessa Thompson. She's a really good actress and TWO THUMBS UP!!!!! Stallone, Eastwood, and Arnold are just way too old now. They were the best back in the day but just look terrible on screen now trying to be like they were when younger. Terrible Rocky movie.!!!! Just awful!!! We need a sequel to Little Man more than we need another awful Rocky film. The worst Rocky yet. This series should have ended a decade ago. Great movie and Stallone will always be Rocky. You new breed should stay home and play simulated games. This kind of stuff is way too much for you powder puffs. Loved this movie.............Michael B. Jordan did a great job as Adonis Johnson and TWO THUMBS UP!!!! Creed 2 (Rocky8), Fantastic Beasts 2, Another Star is Born, another Wreck it Ralph, Another Grinch, Another Robin Hood, Another Transformers, another Marvel yada yada. I used to love going to theaters, but knowing what you're going to see every time is pointless. Am I the only one wishing Rocky had died in one of the earlier movies? The Rocky series started in 1975. Enough already. I don't care. The theater refused to give me my money back. The sad thing about these last two Rocky sequels is that Apollo had two other children and we never learn what happened to them. Don’t understand the last few reviews of one star! I found it entertaining, funny in parts. I thought they blended the previous storyline in very well. As usual, Sylvester Stallone plays his part better than any other actor could! Definitely the worst soundtrack of the entire series; it's really overbearing and makes this a real chore to sit through. Sooo glad I didn't have to pay for this one. Sequel to the funniest Rocky movie is every bit as cheesy; it's impossible to take this story seriously when it's following up a live-action cartoon like Rocky IV. 5 stars Very entertaining movie .. Isn't that life/ generation passion carried on . Very entertaining movie! Creed II was better than Creed.